Victorian furniture fans will be interested in an exhibit on display through March at the Suffolk County Historical Society. The exhibition compliments "Patriot's Corne Forward: Suffolk County's Role in the Civil War." which focuses on the experiences of Long Island residents in the Civil War as well as some larger themes of the war. Withing the larger show, however, is a compelling glimpse of how Americans furnished their parlors during the era - and the story of how this complementary vignette came about is interesting in its own right. 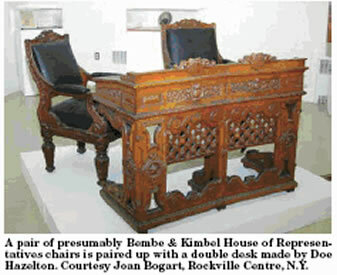 According to Kathryn Curran, exhibition and public program coordinator at the society, she was afforded some timely assistance in setting up the "At Home" section by Rockville Centre, N.Y. antiques dealer Joan Bogart, who specializes in Victorian furniture, accessories and lighting. "This exhibition was unusual for the Suffolk County Historical Society in that I worked with two scholars, both experts in their own fields, Dr. Richart Welch for the overall history of the Civil War and artifact identification and Joan for the 'At Home' section." said Curran. "This exhibition contains extremely rare Civil War artifacts; for example, we have on display a Zouave uniform and a two-man tent, both from our collection. There are hundreds of Civil War items on display. With the theme being Suffolk County's role. I also wanted to include the 'home life' aspect. We have in our collection three Belter chairs and a sofa. I had contacted Joan and asked if she would be interested in working with me on this project." When Bogart arrived and saw the pieces in the society's collection, she told Curran, "When you said you had four Belter pieces, I thought "Oh, here it goes. I am going to have to tell them that they aren't Belter and they will hate me." Bogart's words, however, were "Well, honey, you have Belter!" Bogart loaned the society a Belter parlor table to complement the set. John Henry Belter (1804-1863) was a German-born cabinetmaker and designer. He settled in New York City 1833, where he operated a shop specializing in rosewood, walnut and mahogany furniture. He patented a way to process rosewood in layers to achieve thin panels for fine carving. His shop closed in 1867, just a few years after his death, but his creations are still highly sought-after today. 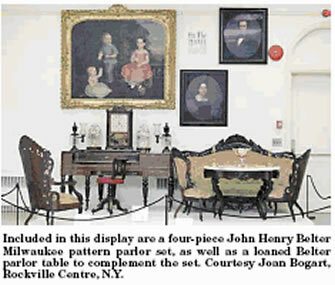 For her part, Bogart said she was totally surprised to find that the museum did have a pierce carved parlor set in the Milwaukee pattern, but that was not all the museum had. She identified the museum's two Ustick Congressional desks as period. "I contacted the historian from the House of Representatives and he gave me the names of every congressman that used those desks for the duration of the Civil War." said Curran. "I must admit, having those desks - and offering the viewing public their place in a historical context - is my favorite part of the entire exhibition. It brought the desks to life." The synchronistic collaboration did not end there, however, "When she [Bogart] saw I was to hang the 1870s etching of [Abraham] Lincoln signing the Emancipation Proclamation, she said 'I have have those chairs, they're from Alexamder Roux's shop, would you like them?' 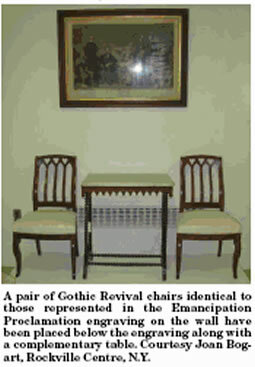 The pair of Gothic Revival chairs identical to those represented in the Emancipation Proclamation engraving on the wall were placed below the engraving along with a complementary table. "Once again these added pieces of furnishings offered an entirely new perspective to the exhibition. "Joan Bogart was a pleasure to work with, and extremely generous in lending pieces that finished the display." said Curran. The Suffolk County Historical Society is at 300 West Main Street. For information, www.suffolkcountyhistoricalsociety.orgor 631-727-2881.